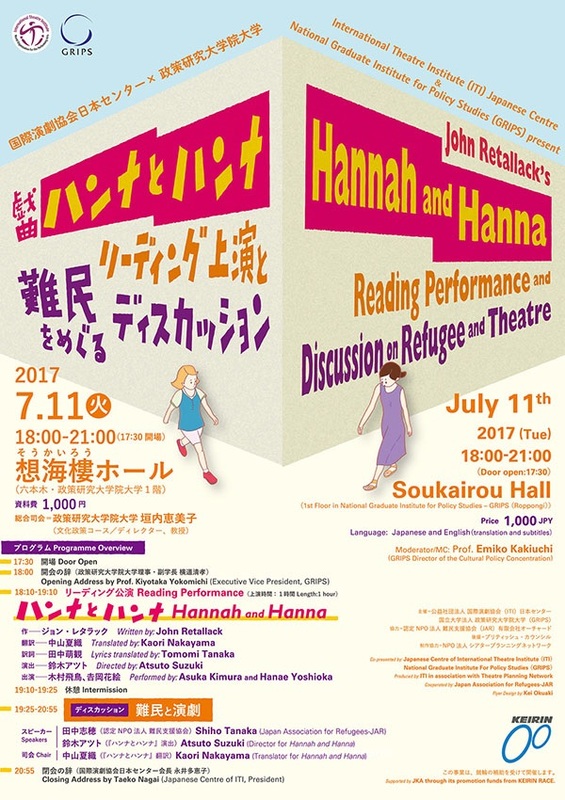 Hannah and Hanna (2001), the award-winning play written by English playwright John Retallack will be presented on July 11th 2017! Set in Margate, the sea-side town in England, and in Kosovo between summer 1999 and spring 2000, this play describes the way how Hannah, 16 years old girl from Margate and Hanna, the 16 years old girl from Kosovo become friends (are getting closer) under the exclusionism to rage. 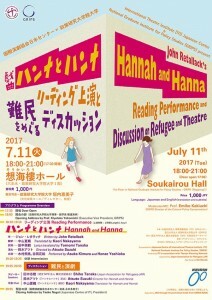 This play has been translated in different languages: Hebrew, Swedish, French, German and others, in addition to Japanese one. In Japan, there are twenty-thousand refugees and their surroundings, who don’t have any idea how to live with them. This story is not only about the past England. 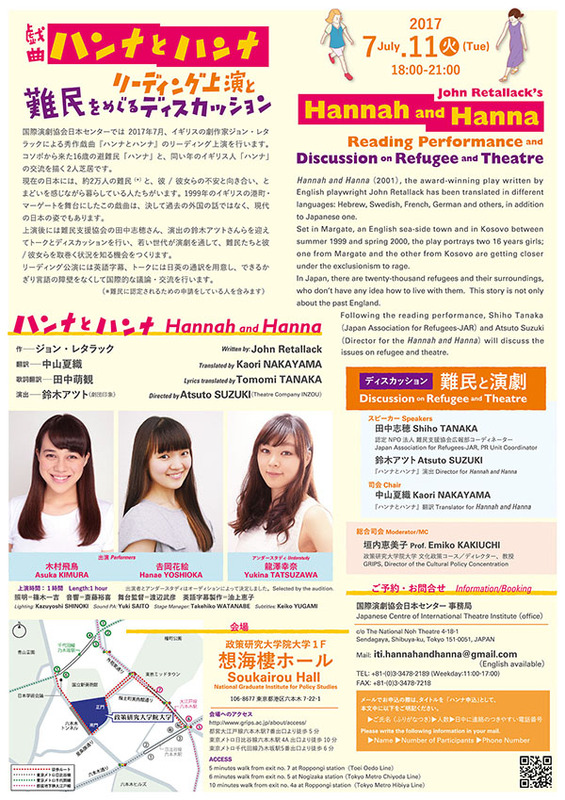 Following the reading performance, Shiho Tanaka (Japan Association for Refugees-JAR) and Atsuto Suzuki (Director for the Hannah and Hanna) will discuss the issues on refugee and theatre. Language: English translation and subtitle are available. Please write the following information in your mail. It is 1999. Hannah is sixteen. She loves karaoke and her bloke Bullfrog; she hates her home town of Margate and the Kosovan asylum-seekers who have come to live there. Hanna is also sixteen. She loves karaoke, loves Margate – and is one of the asylum-seekers, who has fled her country’s war with Serbia, along with her mother and brother. Slowly and unexpectedly, the two become friends, Hannah being forced to face up to her prejudices. This play for two young women addresses important issues through comedy, personal drama and the uniting power of music. This play was written by John Retallack (Script Writer and Director), after the long-term workshop with the young people in Margate. After the world premiere at the Theatre Royal Margate, this was followed by two further national tours and by British Council supported presentations in India, Malaysia and the Philippines. It has been translated into eight languages. The story won a Herald Angel in Edinburgh in 2001. The following year it was presented at the Time Out Critics Choice Festival at BAC and toured nationally. From 2009 to 2010, this play was performed also in three cities in Japan – Tokyo, Osaka and Okinawa. In 2016, the new play Hannah and Hanna in Dreamland was performed in Margate. It tells the story of two friends 15 years on. Born in 1950. British playwright and Stage Director. As he was a college student, he was already active in the artistic and writing activities. In 1977, he founded his theatre group ATC company and started his carrier as its artistic director (-1985). He was the director of Oldham Coliseum Theatre (1985-88) and the Oxford Stage Company (1989-99). His Shakespeare productions for Oxford Stage Company toured internationally and highly acclaimed. In the beginning of the 90s, they performed many times in Japan. In 2001, he established the Company of Angels for creating high-quality/experimental productions for young audiences. Hannah and Hanna was also the production of this company. At this company, he offered not only productions, but also Theatre Café, the platform for sharing the information and opinion about the theatre for the young people. Directors, Artistic Directors and Dramaturgs from all over the England were gathered in this café. In 2010, he became Associate Director at Bristol Old Vic. In 2013, he became Tutor in Writing for Performance at Ruskin College in Oxford and in 2016, he established Oxford Playmaker, the Professional tuition for playwrights of all ages, with his wife, Renata Allen. Atsuto Suzuki is a playwright, theatre director and a founder of Theatre Company INZOU (Indian Elephant). He has collaborated with Korean and Thai theatre artists creating seven co-productions up until 2016. Two of his plays, The Bite and Global Baby Factory were presented in London (2016). The Bite won the audience prize and excellent price, at the Young Theatre Directors Competition 2012, organized by the Japan Directors Association. In 2015-16, he had an opportunity for studying in London for 10 months by a government bursary from Agency for Cultural Affairs. 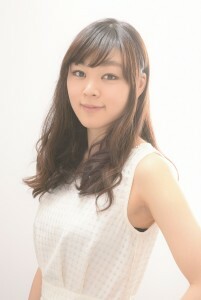 PR Unit Coordinator for the Japan Association for Refugees (JAR) since August 2010. She is in charge of raising awareness and fundraising for refugees in Japan. She published the bilingual cookbook, Flavours without Borders, and held the photo exhibition Portraits of Refugees in Japan. Flavours without Borders contains various recipes from the homelands of the refugees/asylum seekers who settled in Japan. Following her career in a leading food company, she studied international migration (mainly about the Filipino Migrant Women) at graduate school. 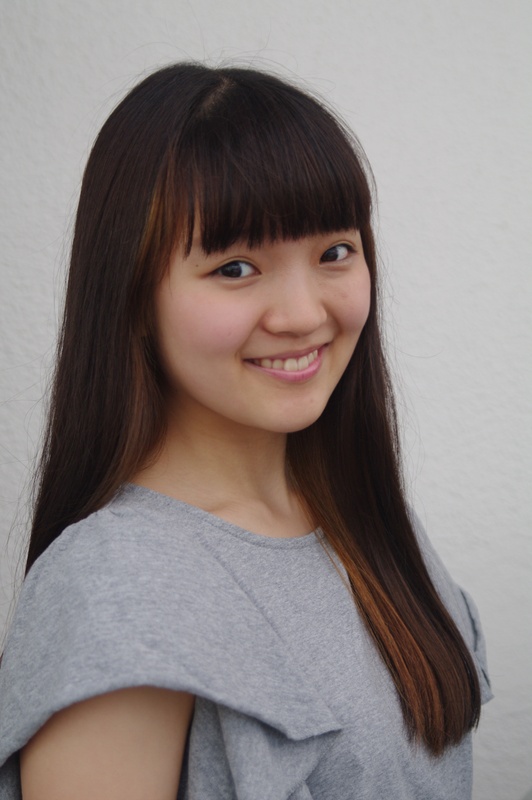 When she was a high school student, she studied abroad in Ohio, USA. She began to develop an interest in migration/refugee issue due to this experience. Japanese Centre of International Theatre Institute is one of the approximately 100 national centres of International Theatre Institute, which is an international organization under UNESCO. The Japanese Centre was established in 1951, and has approximately 250 members. Based on the aim of the UNESCO Charter, we work on projects for contribution to enhancement of mutual understanding between countries, enrichment of culture and realization of peace through promoting international exchange of theatre and dance. Main annual activities are: publishing Theatre Yearbook (Japanese Edition and English Edition) and organizing the project Theatre Born in Conflict Zones, which introduces the plays by translation, dramatic reading and publishing. The National Graduate Institute for Policy Studies (GRIPS) is an international premier policy school with the aim of contributing to the betterment of democratic governance around the world. This Institute excels at providing interdisciplinary education for future leaders in the public sector and conduct research on contemporary policy issues to generate innovative solutions. Founded in 1997 as a stand-alone graduate institute, GRIPS is comprised of world-class academics and distinguished practitioners with expertise in public sector policy formulation and management. Around 20% of the faculty and 70% of students are recruited from outside Japan. The diverse student body consists of almost 400 members hailing from 63 countries and regions – all with the ambition to advance good governance across the globe or contribute to policy related research. Today, this institute’s impressive Alumni network of over 4,000 strong are actively shaping policy in more than 100 countries around the world. Japan Association for Refugees, JAR, is an organization that supports refugees and asylum seekers so that they can live safely in a new country. Furthermore, JAR works in order to realize a society where both citizens and refugees can live together. At JAR, professional staffs support and consult each cases. Annually, there are over 3,500 cases (660 visitors from 66 different countries). In the legal unit, JAR works closely with lawyers to facilitate procedures for recognition of refugee status for those who must be protected. 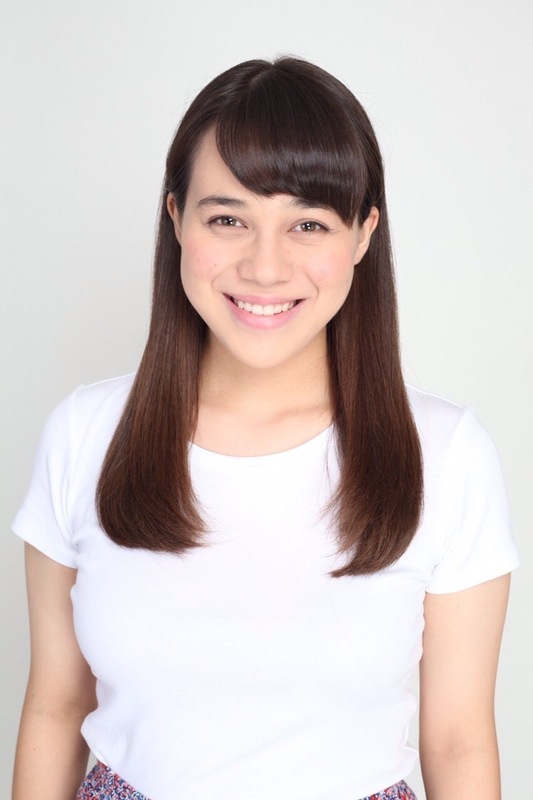 In the social unit, JAR provides support by bringing out the strength of each individual and assist their path to become independent through the tough initial settlement period in Japan. 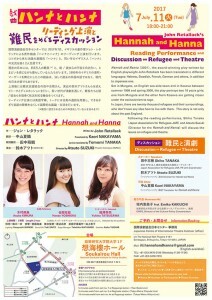 In addition, the purpose of our work is to promote effective change in refugee protection in Japan. This is carried out through policy recommendation, investigative research, and sharing information. Established in 1999, JAR is currently working with 25 staff members and about 30 interns and other volunteers. JAR is also one of the official partners of the United Nations High Commissioner for Refugees (UNHCR) Representation in Japan. Copyright © 2013 Japanese Centre of International Theatre Institute, All Rights Reserved.